Most modern-day Americans never consider a career in farming. They may see it as impractical, nostalgic, or even unnecessary in a world full of mass-produced, easily-accessible, and seemingly endless food options. But with the downfall of the family farm and the declining integrity of American agriculture as a whole, the need for the next generation of farmers has never been greater than in recent decades. In 2000, New York’s Greenmarket co-founder Bob Lewis not only recognized this need, but saw a potential solution: New York’s vibrant immigrant population. Despite the lack of farming fervor in the U.S., the agricultural lifestyle still thrives in many countries. As a result, immigrants often come to the U.S. with a wealth of farming know-how and experience, but with no productive outlet for their skills. With the New Farmer Development Project, Lewis hoped to remedy this issue by offering immigrants the resources necessary to start their own farming businesses. Today, the program offers education and resources not only to immigrants, but to all aspiring farmers with the goal of promoting sustainable farming and providing succession plans to aging farmers. “The new farmers in our program are interested in creating sustainable businesses and in being part of a larger movement,” said Greenmarket Communications Associate Maria Rojas. 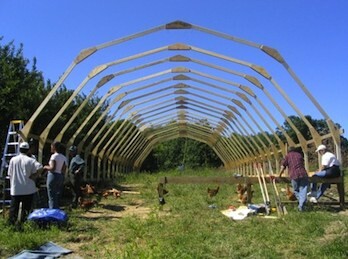 According to Rojas, aspiring farmers who participate in the project begin with an eight week Farm Beginnings course. Farm Beginnings provides participants with comprehensive agricultural training and prepares them to begin a farming enterprise. After graduating Farm Beginnings, participants are provided with 3 years of technical assistance, which includes mentorship and land identification assistance. Furthermore, program graduates are given the opportunity to participate in an advanced training program and are offered discounts on Greenmarket farmers markets and assistance securing capital. The project is entirely grant funded with most of its funding coming from the USDA’s Beginning Farmer and Rancher Development Program (BFRDP). The project also receives funding from the Doris Duke Foundation and the USDA Risk Management Association and, according to Rojas, the project has been incredibly successful in meeting its objectives. Since its launch in 2000, the project has helped to start 23 farm businesses, with over 200 aspiring farmers having completed the farm business planning course. The farms created through the program are family farms that often specialize in vegetables and crops from their homeland and contribute to a thriving, diverse marketplace. “One of the exciting things about these farms is that they create market diversity, and give New Yorkers access to culturally appropriate, nutritious, local food,” said Rojas. Despite its overall success, the New Farmer Development Project grapples with the same challenges that confront small farmers across the country; mainly, Rojas says, the struggle to gain access to long-term land tenure and farming capital. They also walk a fine line between being enthusiastic advocates of small farm entrepreneurship and warning new farmers of the challenges that come along with it. The broader goal of the project relates both to sustainable agriculture and to social justice. “Sustainable is a word we use a lot in our project, but its meaning extends beyond agriculture,” said Rojas. “It encompasses the farmers, the local communities, the buyers and the land.” In order to promote sustainability among its farmers, the New Farmer Development Project promotes practices like seed saving, biological pest control, crop rotation, cover cropping, composting organic soil amendments, integrated pest management, crop diversity, water conservation techniques, green manure, managed grazing, and local selling.